The iRobot Roomba 630 Vacuum Cleaning is equipped with everything that’s needed to keep a home clean. 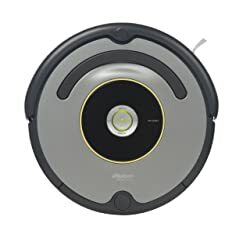 You can start a cleaning cycle with the push of a button at half the price of the top line Roomba models. It’s especially recommended for the busy people who don’t get enough time for regular maintenance. This robot vacuum has a patented 3-stage cleaning system, which helps it pick up various types of debris like dust, pet hair, and small debris from all flooring surfaces and combinations. This Roomba has a special technology which enables it to choose from its different robotic behaviors, more than sixty times in every second. This allows it to clean your floor more thoroughly by making multiple passes over the floor with different brushes every second. Cleans every corner of the room: The advanced cleaning technology allows it to clean under and around the furniture, the edges of the walls, under the bed, behind the curtains, etc. It avoids the stairs and can even navigate through loose wires on its own. ​Detects dirtier areas by itself: It has the special dirt detecting technology, which uses an acoustic sensor to detect the dirtier areas by itself. It then cleans those areas more extensively. ​Can clean the house just with the push of a button: The Roomba 630 Vacuum has been designed to start cleaning as soon as you push the Clean button once. It can do the rest of the job by itself. It will even return to its dock, i.e. the Home Base and recharge between cleanings. Thus, vacuuming has become even more convenient with the Roomba. ​Easy to disassemble: You can replace the parts without putting much effort. You can even clean every part of the vacuum in a single 30-minute session. ​Good for pet hair removal: Pet owners are highly satisfied by its pet hair removing capabilities. It can easily keep up with the amount of the pet hair in your house, even during shedding season. Even though it does great cleaning, it struggles with certain types of debris like sand, stones or large bits of paper. It struggles a bit while cleaning very thick carpets. You might need to use a larger vacuum for deep cleaning purposes. It might get stuck while transitioning from hard floors to thick rugs. Some of the customers have faced this problem, so you should keep an eye on it to make sure there’s a successful transition. 3-stage cleaning system: It has a patented 3-stage cleaning system. Its spinning side brush can clean the wall edges, as the counter-rotating brushes absorbs all sorts of dirt, debris, and pet hair from the floor. ​AeroVac Technology: It has a powerful suction technolog which pulls the hair off the Rumba’s brushes and transfers it in to the AeroVac bin. The AeroVac Technology works flawlessly to fill the bin evenly so that you don’t have to empty it as frequently. ​Improved Brush Design: This improved design helps the vacuum to pick up more dirt and a variety of types of dirt and debris without issues. It has multiple types of brushes to help it clean thoroughly on all surfaces. ​Dirt detecting technology: The robot vacuum detects dirtier areas by itself and then cleans those areas more thoroughly to get an even clean on the whole room. ​Virtual Wall Technology: This technology creates a virtual barrier that the Roomba will not cross. You can keep it in the area in which you want to and out of the ones you don’t want it to enter. iAdapt Responsive Navigation Technology: It helps the Roomba to clean the rooms more thoroughly, as it reaches every corner of the room. It can even navigate through loose wires on the floor and under taller furniture. Cliff detecting technology: This technology enables the vacuum to avoid the staircases by itself so it will not fall down from the stairs and get damaged. Most of its customers are very satisfied with Roomba’s after-sales service. The equipment comes with a one-year warranty and the battery has a six-months warranty. All the cleaning instructions and the instructions for replacing the parts are very clearly given to help you perform replacements and routine maintenance. So, if you follow them properly, you will not face any problem handling this robot vacuum. You can get a lot of features at a very good price. It’s definitely worth trying out if you want some help cleaning up around your home.